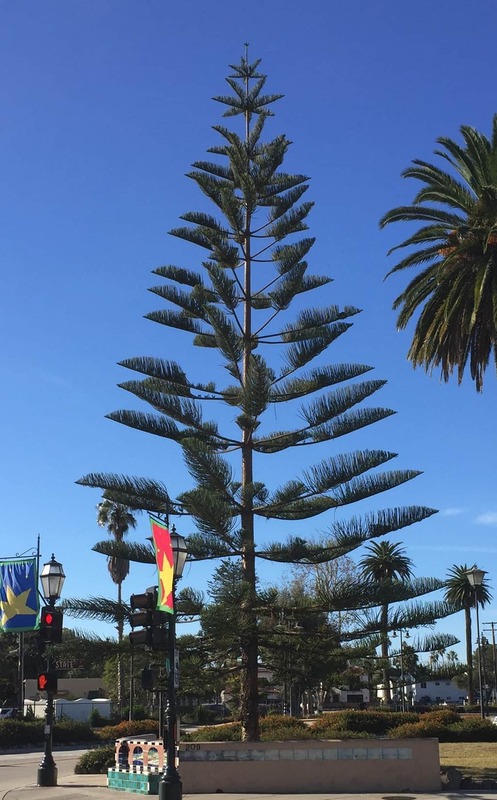 Santa Barbara’s skyline is punctuated with the upper spires of many handsome Norfolk Island Pines – commonly known as “Star Pines” for their remarkably star-shaped top whorl of branches. 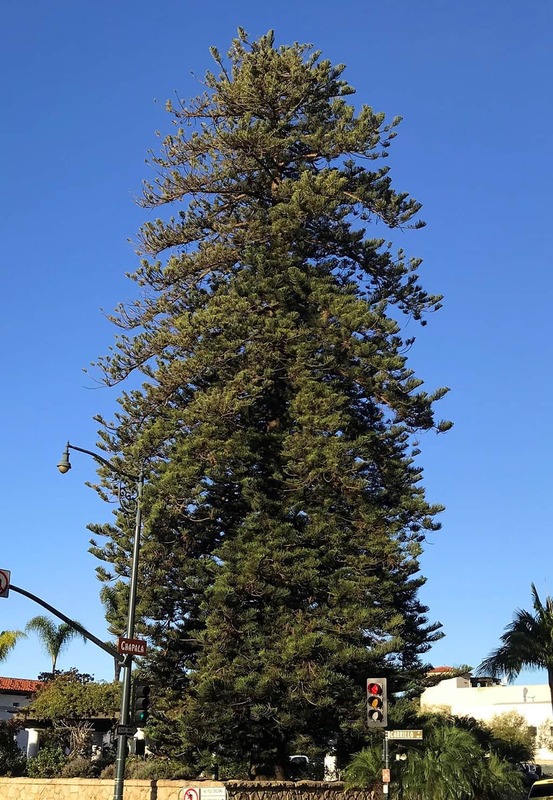 Perhaps the most recognized and iconic one in town, known as “Santa Barbara’s Tree of Light”, is on the corner of Carrillo and Chapala Streets. This healthy tree is over 120 years old and is nearly 120’ tall – the height of a 12-story building. Every December for the last 90 years, members of the International Brotherhood of Electrical Workers have decorated it with white lights and a shining star at the top, truly making it a “Star Pine”! Though not actually a pine, the Norfolk Island Pine is a majestic conifer that can reach heights of 200 feet on its native Norfolk Island in the South Pacific Ocean. Understandably, to accommodate its roots and eventual massive size, it needs to be given a large space in in the landscape. Its botanical name is Araucaria heterophylla. Araucaria refers to the Araucanian Indians of central Chile, where other types of Araucaria species are native. Heterophylla comes from the Greek for “different-leaved”, referring to the differences in its juvenile and adult leaf forms. This tree has two distinct types of leaves born on long twigs that point to the sky. The juvenile leaves can be up to ½ inch long, are spirally arranged, extend away from the stem, and have sharp, pointed ends. The adult leaves are wider, flattened and scale-like, incurved and overlapping, resulting in mature twigs of up to 2’ in length that appears to have been carefully braided and are surprisingly sleek to the touch. It is notable for its very symmetrical form, with widely-spaced whorls of horizontal branches extending from a straight, single trunk. It is monoecious (meaning that it carries male and female cones on the same tree) and bears 2” long, cylindrical, male pollen cones and 3-6” diameter, nearly-round, spiny female seed cones. Despite being native to an island in the Pacific Ocean, this tree is now widely grown in coastal, sub-tropical, and Mediterranean climates around the world. Being very adaptable to a broad range of climates and soil, it grows well in Santa Barbara. It can survive on our normal rainfall, but looks better with irrigation in the dry season and during droughts. Fortunately, it does not seem to be bothered with any serious disease or insect pests. A star of a tree, by any name. Norfolk Island Pines can be seen on the west side of the County Courthouse, in West Alameda Park, at the Santa Barbara train station, near Our Lady of Sorrows Church, at 815 Quinientos Street, in private yards in the Upper East side, and, of course at the corner of Carrillo and Chapala Streets.